Are Covenants Relevant to Business Leaders? In yesterday’s Life for Leaders edition, we focused on the covenant God established with Noah, his progeny, and, indeed, all creatures on earth. I talked about how covenants are like contracts, though distinctive in their binding and one might say “serious” character. We might talk about the covenant of marriage, for example. But we would not say that we established a covenant with someone to paint our house. You may have wondered if the notion of covenants is relevant to today’s world beyond the church. Do covenants matter, for example, in the business world? Max De Pree, the esteemed business leader after whom the leadership center I run is named, would answer this question with a rousing “yes.” In his experience running a highly successful furniture company (Herman Miller), covenants are essential. In his bestselling book, Leadership Is an Art, Max writes, “I am convinced that the best management process for today’s environment is participative management based on covenantal relationships” (p. 61). In fact, he believes that “Leaders owe a covenant to the corporation or institution” that they lead. Covenants bind people together and enable them to meet their corporate needs by meeting the needs of one another” (p. 15). Covenantal relationships enable corporations and institutions to be hospitable to the unusual person and to unusual ideas. Covenantal relationships enable participation to be practiced and inclusive groups to be formed” (p. 28). A covenantal relationship rests on shared commitment to ideas, to issues, to values, to goals, and to management processes. . . . Covenantal relationships reflect unity and grace and poise. They are an expression of the sacred nature of relationships. Covenantal relationships enable corporations to be hospitable to the unusual person and unusual ideas. Covenantal relationships tolerate risk and forgive errors” (p. 60). When Max speaks of covenants, he envisions deep, mutual, sacred commitments and agreements. They reflect the sacredness of each person and the relationships among people. They are freely engaged by those in the covenant, rather than coerced or required. A company that has a covenantal relationship with its workers seeks their good as well as the good of the company. The leader whose leadership is guided by covenants seeks the best for those who are led, so that they might flourish as the organization flourishes. Much more could be said about covenants in business settings, of course. I would point you to Leadership Is an Art if you’re looking for more wisdom here. Let me close with two further thoughts. First, when a business leader of Max De Pree’s stature claims that covenants are essential, today’s marketplace leaders (not to mention those of us who lead in the non-profit world) ought to pay attention. Second, if God structures relationships by covenants, it makes sense that we, in our leadership, should do the same. Presumably, it’s a good thing for us to imitate God’s leadership. As you think about your leadership, to what extent are covenants present or implied? How important are they? How might your leadership and/or your organization be strengthened through more explicit covenants? Gracious God, thank you for establishing covenants that shape our relationship with you. Thank you for making commitments that you will keep with us, even as you ask us to do the same with you. Lord, in our life and leadership, may we live covenantally. May our relationships with those we lead be based on a deep commitment to their well-being. Keep us from seeing people as cogs in a machine. Rather, may we honor them in their sacredness and uniqueness. Thank you, most of all, for the New Covenant you have forged with us through Jesus Christ. Amen. 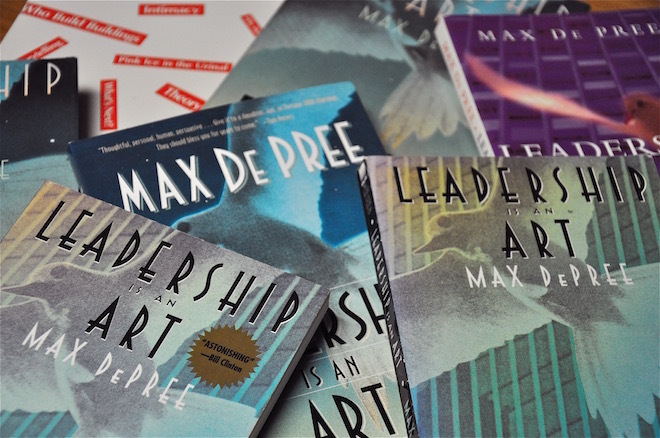 Photo courtesy of Catherine Beaton — Max De Pree Center for Leadership.